Ottolenghi's Black Pepper Tofu.After a trip to Uwajimaya to stock my Asian pantry, I made this relatively straightforward tofu recipe. The pepper was intense, but in a good way. Incredibly rich and flavorful, this dish is fancy enough to shine as a weekend meal for sure. The biscuit is of course a much different medium than the bagel, but the enjoyment factor was in the same ballpark. I'd recommend steering clear of the "holy cow i feel ill"-inducing options such as fried chicken with tabasco black pepper gravy, and instead going with something more simple, like the fennel sausage and egg with pepper relish and fontina. But then again, who am I to say what your weekend morning might call for. Pecan Pie. This Thanksgiving, for the first time, I added a third slice of pie to my already crowded dessert plate: chocolate pecan. I couldn't believe what I'd been missing for so long! And then, at a delightful holiday party around Christmas, the hosts served me my second pecan pie. It totally hit the spot again. Although I have to say I would have switched the pies if possible. I think a delicate, slightly sweet pecan pie is great alongside pumpkin and apple, whereas the chocolate pecan stands out solo. My friend Leigh shared a recipe for the latter which I can't wait to have the occasion to bake. Delancey. When I turned 28 in November, I was lucky enough to gather ten of my closest friends for a dinner at Seattle's best artisan pizza joint. The best part about having a party of 11? Making a reservation! They only take reservations for parties of 6+, and without one the wait is still usually 2 hours, even years after their opening. We kept the ordering simple: one of each pizza on the menu. The crimini was my favorite as always, but everything was sensational. I love that place. Orangette was even in the house - I decided to pretend she knew it was my birthday and was nearby to celebrate. Yeah right. Euclid Hall. On an early December trip to Denver, we wanted to try some of the region's famous microbrews. And of course one can't just drink a high-quality beer solo. Delicious gastropub fare alongside is often our requirement. Thankfully, a quick internet led us to Euclid Hall, ranked by Esquire magazine as having one of the top ten beer menus in the country. The beer list was indeed impressive: great selections on tap, and a bottle list organized by increasing complexity by mathematic terms. The food didn't disappoint either. 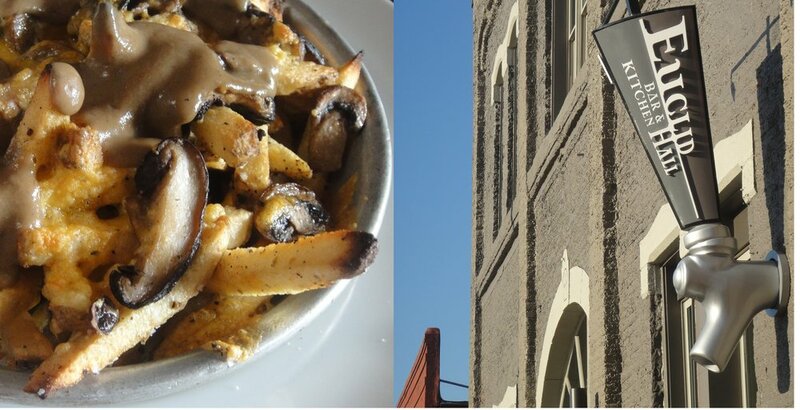 We had wild mushroom poutine with porcini gravy and Wisconsin cheddar curds, a double decker chicken schnitzel sandwich on dill rye with aioli and apple cabbage caraway slaw, and some "hot, spicy and very sincere pickles" on the side. Based on this restaurant and our lunch at Masterpiece Delicatessen, I was quite encouraged by Denver's food scene.